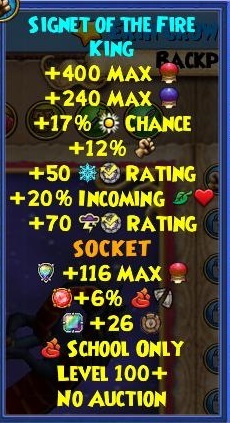 Flat jewels are a misinterpreted stat for Wizard101. They have been since the beginning of the Spiral’s time. In fact, most players get rid of these jewels thinking they have no value. But it’s not true! I’ve used them since their introduction into the game. Many of my solo runs are successful because of these resist jewels. Flat stat jewels come in two main categories: offensive and defensive. The offensive stats boost your damage while the defensive absorb incoming damage. 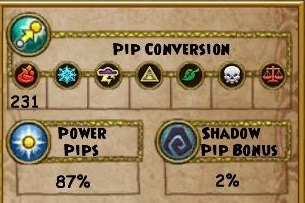 These stats are static, meaning that pierce does not affect flat resistance. Likewise, flat damage is not hindered by resistance in its final value! Many online sources that mention flat stat jewels are incorrect. 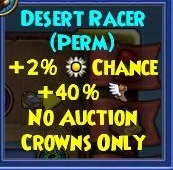 Here are the stats for my testing. Let’s use it as an example to see the calculations. The concept of flat jewels is the same for flat damage and flat resistance! Let’s assume you’re about to take an attack dealing 1000 base damage. Flat resist works like an absorb. 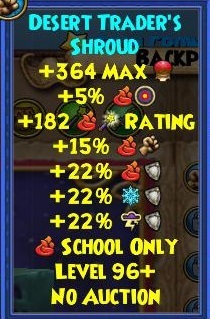 In this example it will remove 50 damage points from every school and 158 from Shadow School, before regular resist takes damage. So, what if the situation changed where the attack does 4000 damage? The jewels would still absorb 50 damage points from every school and 158 from Shadow School attacks. Then our percent resistance would reduce the rest of the remaining damage. For X damage, we will absorb 50 from every school and 158 from Shadow School. Grandfather Spider has a universal 120% damage boost, 7% universal pierce, and 20% fire resistance. His attacks are not only of the school of storm, but also of the Shadow School. 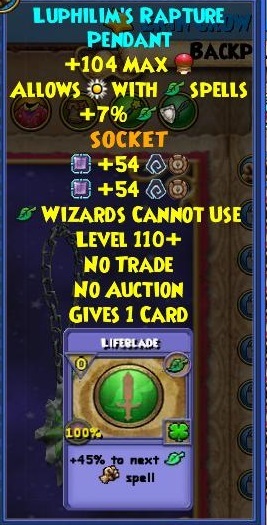 He also has Balance Mastery and uses 3 Balance spells. His natural attacks deal 330 X 14 = 4620 base shadow damage if he has max power pips! [(4620 X ( 1 + 120%)] X buffs = (4620 X 2.2) = 10,164! So , we should prepare for Storm and Shadow hits. 6 X 330 = 1980 X 2.2 = 4356 damage, and that number will double if he lands a critical! [(spell base damage X (1 + damage%) + total flat damage] X buffs= [1445 X (1 + 120%)] = 3179 damage! 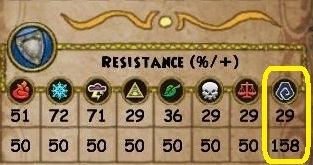 My Shadow resist: 29 – 7 (pierce) = 22 (incoming damage – total flat resist) X (1-resist%) = 3179 X (1 – 22%) = 3179 X 0.78= 2480! 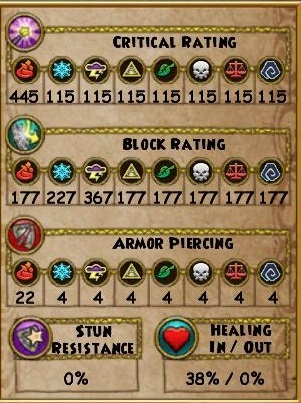 The difference between 1844 damage and 1752 is due to the flat stat jewels! The differences might seem minor, but if you combine jewels in different pieces of gear, you will notice that they make a big difference. *Attention! Not include all the decimals results in two formulas, rounds down after each calculation. The exception for that rule, is only in the pets damage or resistance! We need exactly the percent of the pets to calculated correctly! Don’t forget that since Grandfather Spider has shields, the actual number would be less. This was just a quick example with math! As you can see, flat stat jewels can help our fights in their own way. I hope this makes you think twice before tossing those flat stat jewels away! 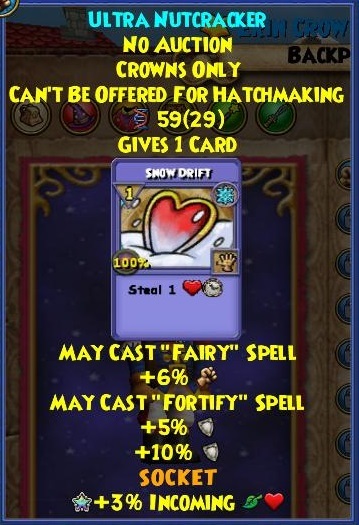 I have shown my stats below for convenience. Thank you as always, and best of luck questing! 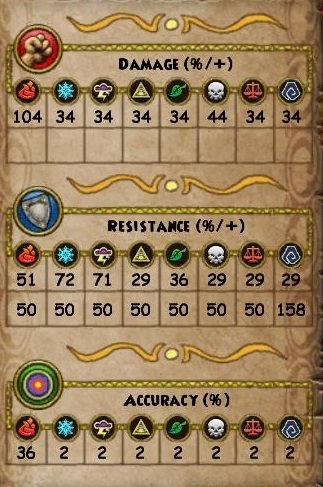 *You can see the stats which I used for the above calculations as well as my gear, in the following pictures. Also, you can see the battle that I describe above from my solo video at Europeans servers when I was 120 lvl, one year before.